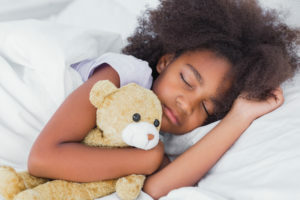 Whether it’s a stuffed animal, doll or blanket, many children will become attached to certain objects. Sometimes these objects are called “loveys”, transitional objects or comfort objects. Loveys can serve several purposes with your little one; they can help children transition from a familiar place or situation to an unfamiliar one with ease and give them more confidence. For instance when moving to a new city, starting a new school or transitioning to a big kid bed, they will use their lovey to help relieve stress and bring comfort because it is something familiar thing in times of change. Not all children will have a lovey and that’s okay. Some children may prefer to self soothe in other ways. This way if your child loses their lovey or it needs to be washed you will have an immediate replacement, causing minimal stress for both you and your child. For hygiene purposes and smell, it’s best to get a lovey that is easy to wash. You can have your child watch you toss their lovey into the wash, and reassure them that their lovey will be fresh and clean in little to no time. If your child won’t part ways with their lovey for a short amount of time another option is to have your child help you hand wash their lovey. Most likely your child will want to bring their lovey with them everywhere. Creating designated areas and rules for the lovey will help limit the places where your child may misplace it. Rules you create should be based on their need for it. For instance, a great rule is to only allow the lovey inside your home and car. Loveys are a way to ease separation anxiety and can help your little one become more independent and feel safe while experiencing new things. Many children will grow out of their attachment to their lovey but some will hold onto their object much longer. 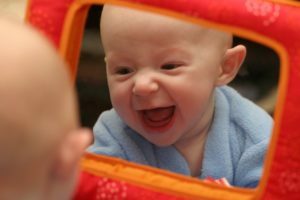 Want a toy that will keep your baby entertained and that is also good for their development? Put your wallet away, because you probably already have this in your home: mirrors! In today’s busy world of schoolwork, soccer practice, and music lessons it can be tempting to let family meals slide. However, there are many benefits to having meals as a family.